Vertical vibrations, exercise time and vibration intensity setting, wide grips, anti-slip surface. Vibration Machine inSPORTline Lilly offers a great way to exercise your muscles. Its function is based on vibrations that cause your muscles to flex reflexively, making exercising more intense. All you need to get an immediate result are 5 minutes of standing on the machine with your knees slightly bent. With this machine, you can exercise your entire body. All exercises are described in detail in the user’s manual. The machine is able to calculate the fat percentage of your body based on input data about your height, weight, age and gender. In the manual, you’ll find a detailed table that will help you correctly interpret the results. 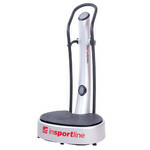 Vibration Machine inSPORTline Lilly is suitable for home use only. By observing the weight limit of the product, you significantly increase its service life and prevent it from wearing down prematurely. It is not recommended to exceed this limit.